Bandits and Bib Transfers - Please Don't!! It’s great that so many runners enjoy the course, this Sunday’s Amica Iron Horse Half Marathon, 10K and 5K reached capacity because of its popularity. However, questions we’ve received from those shut out by course limits prompt us to assess hotly debated topics in the running community. Bandits and bib transfers. We’ll start with the simpler of the two scenarios. Bib transfers are not allowed first and foremost for safety purposes – we don’t know who you are if you get hurt or an emergency situation occurs. Period. Not knowing who you are is a scary situation. I have had too many conversations (any one is too many) with family members of runners transported by medical. Making that family contact immediately is necessary on many levels to ensure the best possible physical and emotional care for the runner. At the end of the day, there’s nothing more important than keeping everyone safe. People ask us why we can’t do bib transfers in person on race day, a logistic impossibility on many levels. It’s nowhere near as simple as saying “I’ll just give my bib to a friend and they can give you their name”. Really, it doesn’t work that way with hundreds or thousands of runners on race day. 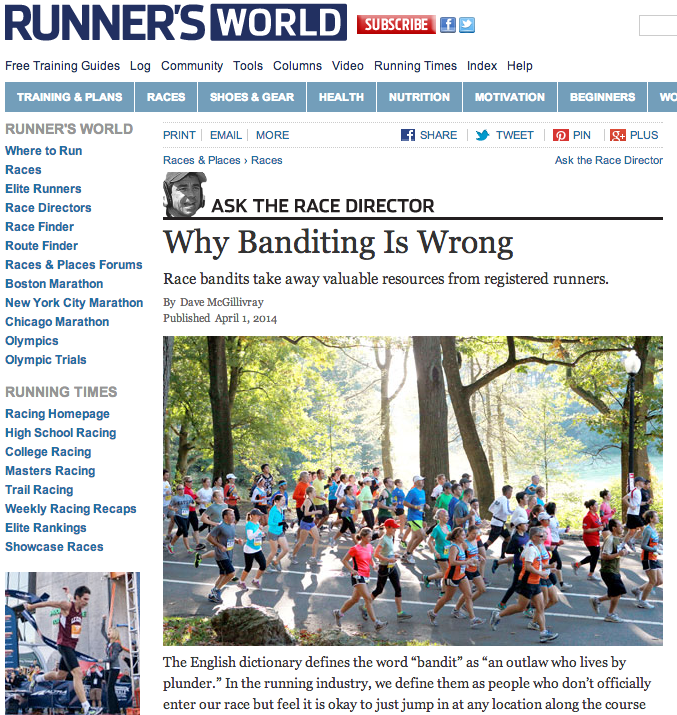 And, bandits… Bandits make a race dangerous – we don’t know who they are so if injury occurs, we’re back at square one with major safety concerns (re-read above if you don’t think that’s a valid dissuasion to bandit). We’re also not planning on extra bodies on the course so increased traffic causes safety concern that can negatively affect others, you know, the people who paid to participate. Everything a bandit uses is a stolen service from those who entered honestly – water, portalets, medical services, food etc. They are stealing. Everyone else registered and paid the entry fee, which also provides for police, medical, road closures and all the other expenses of the race. And, our permits allow only the number of people set by course limits to run, so bandits are also jeopardizing the continuation of the race by breaking our permit. Please don’t do it. Please discourage others from doing it. You wouldn’t dress up for a wedding, hit the dance floor and eat the cake because it was a public venue, and there isn’t even a major safety risk there! It's On. Are You In? 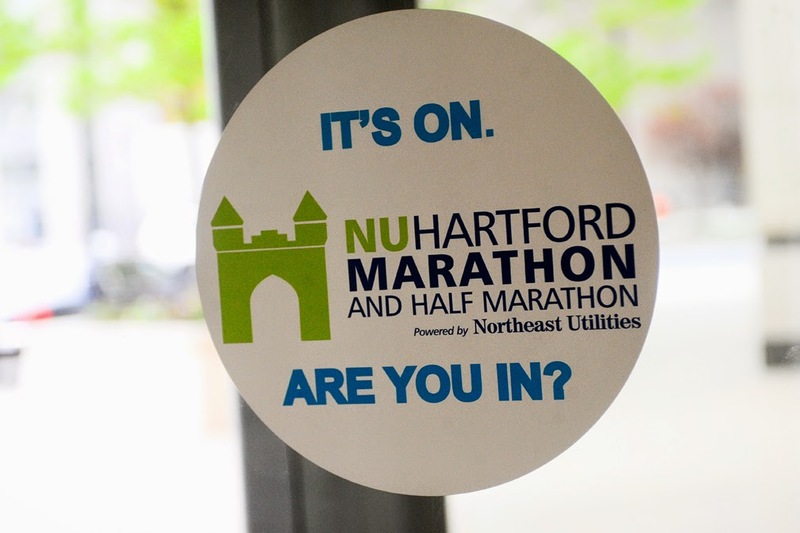 Thanks so much to everyone who came out yesterday and to those who liked, shared or commented on our NU Hartford Marathon announcement updates and showed us support. 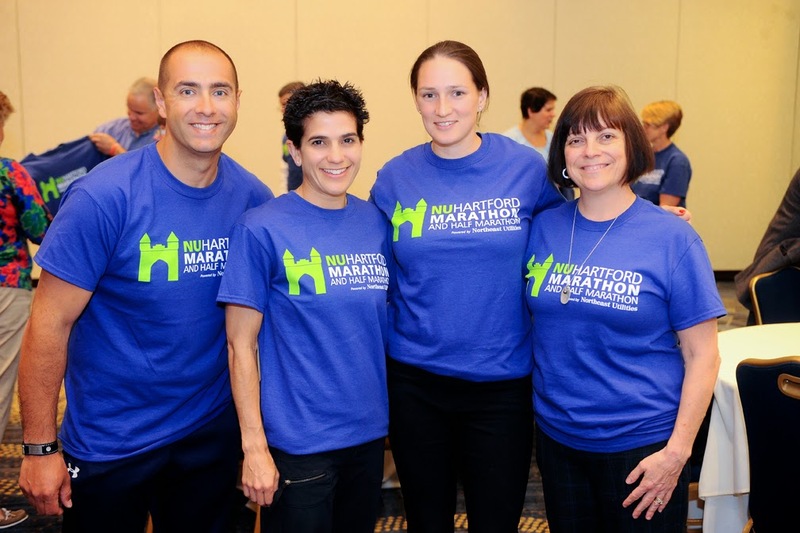 We are excited to harness all of this positive momentum to create new programs, grow in areas we've heard positive feedback on and tweak what we can to continue to do better for the runners, charities, communities and kids we work to support. We wanted to share a few photo highlights of our announcement event. And as a show of thanks to everyone who registers by May 31, we'll be sending you a car cling (for bragging rights, of course!). Thanks again and please check back for some fun new promotions and contests we'll be running on Facebook and Twitter to recognize "What powers your run". 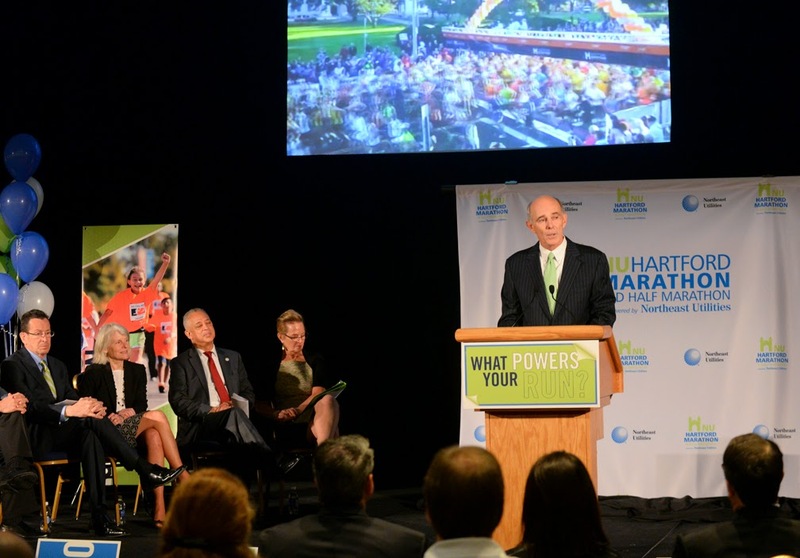 talks about the history of the Hartford Marathon before introducing the new sponsor. 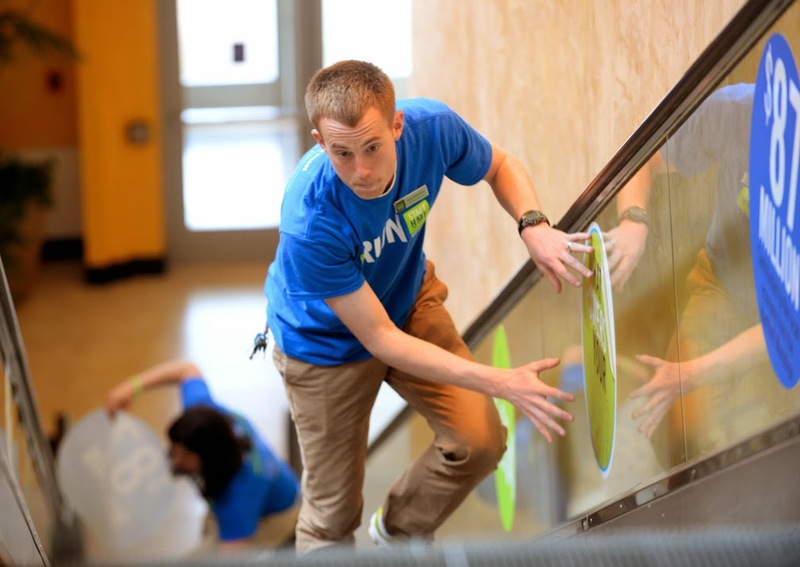 New England-based company chose to support the marathon, half marathon and 5K event. helps decorate the Marriott Downtown with event logos while the announcement is being made. Spectators and participants at the announcement event. communities support the annual event and benefits for the area. and how the event motivates people to healthier lifestyles. HMF FitKids Fun Run and Final Mile events. 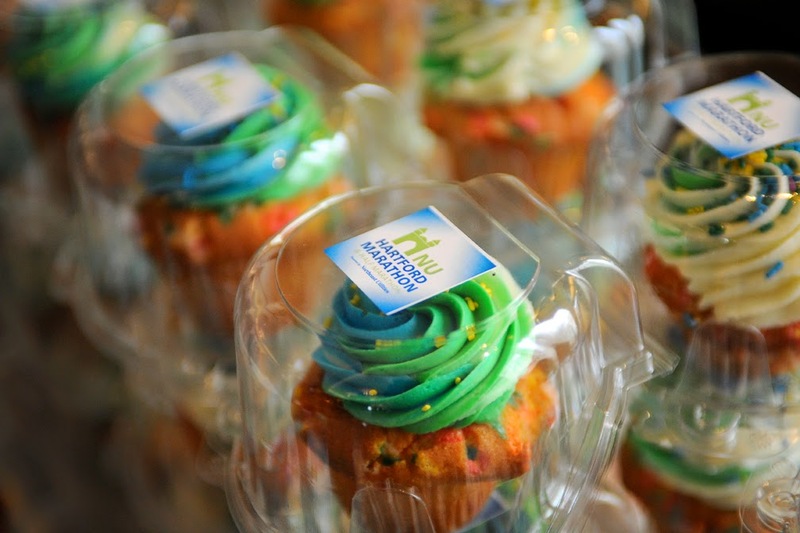 serve as inspirational ambassadors for HMF events. NoRa Cupcakes at the post-event luncheon. Thank you all for taking the time to join this exciting celebration. 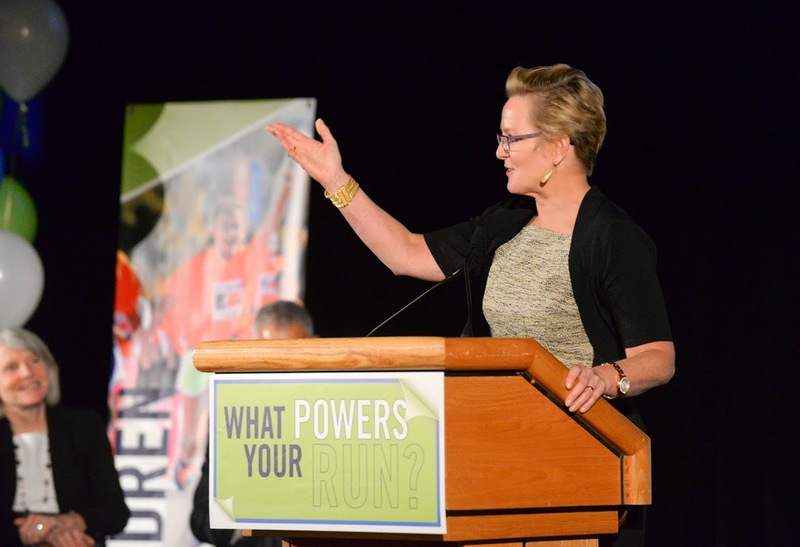 I am Beth Shluger, founder of the Hartford Marathon Foundation and race director of the Hartford Marathon. I am both proud and humbled to be standing here today, sharing the next great milestone of an event that touches more than 100,000 people each year. 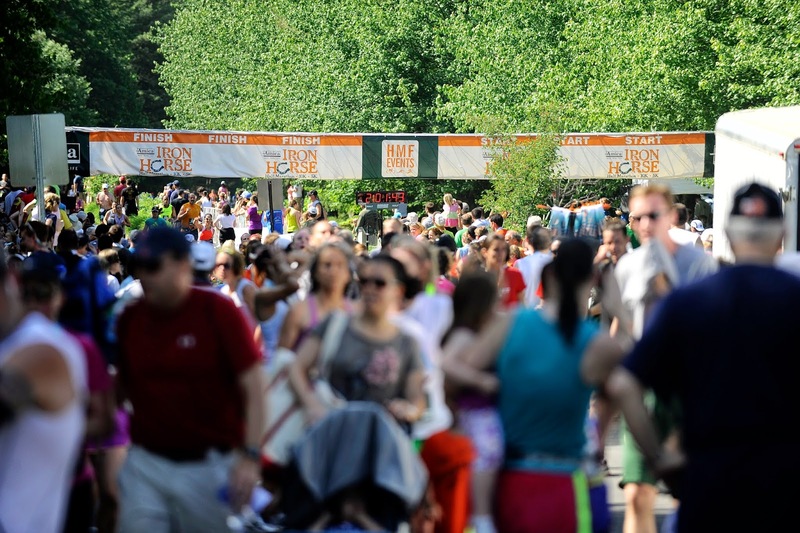 We wouldn’t be here without Aetna, United Technologies and ING, their incredible support as our title sponsors over the last 20 years has helped make the Hartford Marathon what it is today. We had a group of 12 people on the organizing committee. We had a budget of $30,000. We did not have the internet – is that even possible? 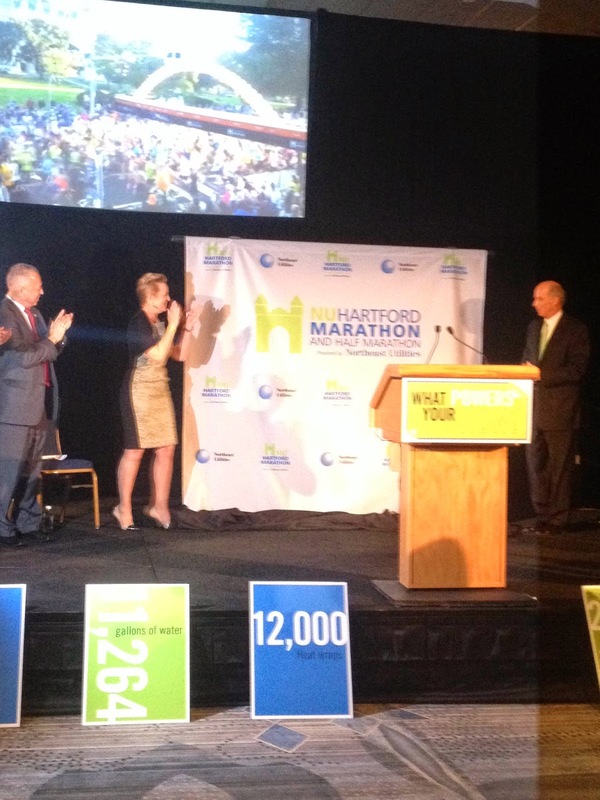 Today, we have over 2,400 people working to produce the Hartford Marathon. That $30,000 budget goes just to finisher medal expenses today – which most runners think is the most important thing anyway. But - the mission of the Hartford Marathon has never waivered. We support Health, Community, Charity and Children. In 1994 we wanted to make a positive impact on our community. We wanted to improve people’s health, and to teach kids to make running and fitness part of their daily lives. We wanted to encourage and support runners to make their race about a cause bigger than just crossing the finish line. And together with those goals, we wanted to show everyone how great our city and our communities are, show them the beauty and the people – one mile at a time. 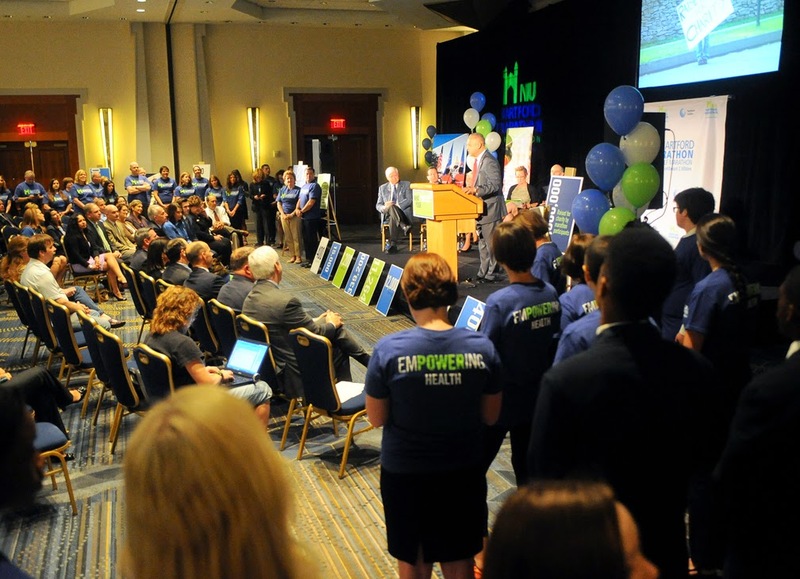 We stand ready to take on the next 20 years with new programs and services, more people than ever and exciting innovations to benefit Health, Community, Charity and Children. We are so excited that our new partner and title sponsor shares our passion and our mission. 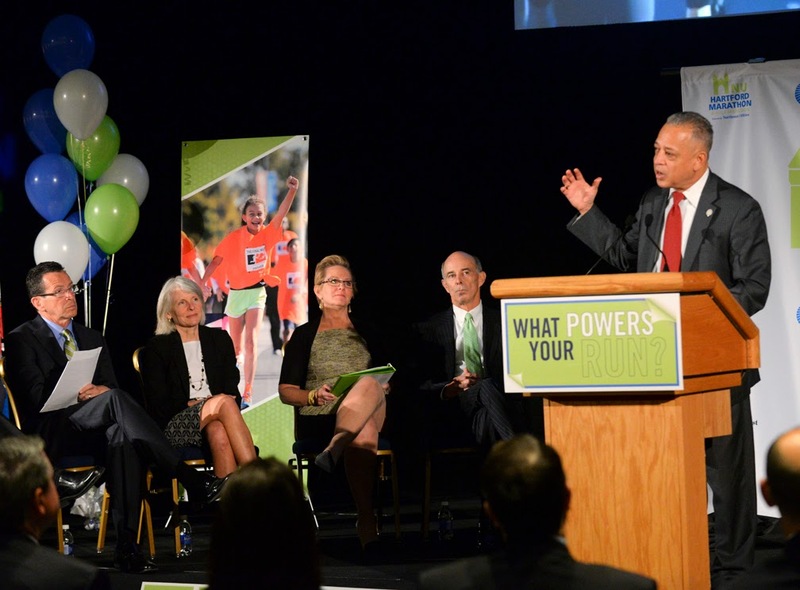 With great pleasure, I ask that you welcome Tom May, CEO of NORTHEAST UTILITIES to unveil the NU Hartford Marathon and Half Marathon, powered by Northeast Utilities. 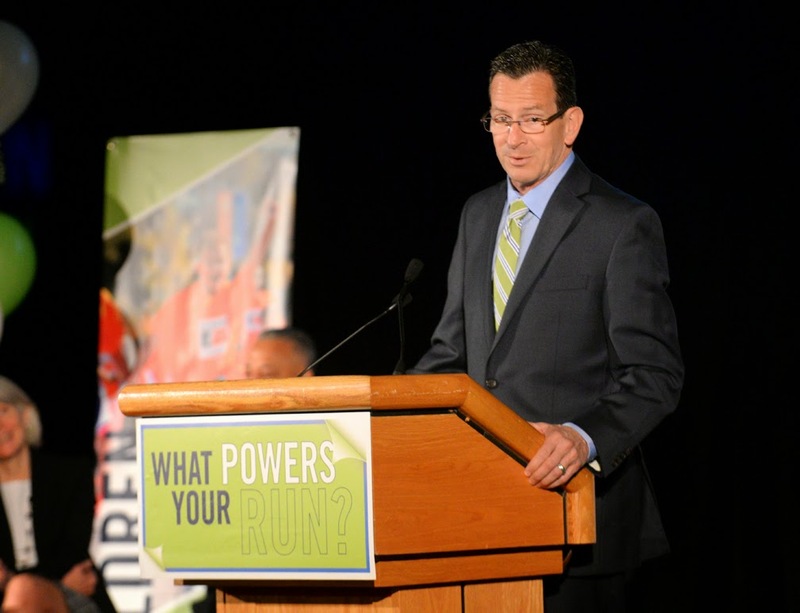 On behalf of the runners who achieve greater health, the communities who experience economic boost, and the charities and children who will grow and benefit through the NU Hartford Marathon, I want to express my sincere gratitude to Northeast Utilities. The numbers you all see around the room today represent just a few of the many facets of this event that will be bolstered with the support of our new partner. This week, we asked elite runner and Team HMF member Katie Edwards of Glastonbury to share a little more on the balance of being a runner and a mom. Becoming a mom (times three) is one of the greatest blessings in my life. Another great blessing that has found its way into my life is running. You would think finding a way to make the two coexist shouldn’t be that hard, but sometimes it can be for a working mom, or even for a non-working mom. Running is a gift. It’s a gift that I did not always love, but the longer I let it settle in to my life, the more it became a part of me and allowed me to get to know me. It took me a few years to realize this. Having 3 children in as many years gave me a run for my money and running has given me a breath of fresh air that I desperately needed. I ran my first race ever, the ING Hartford Marathon, in 2008, after baby #2. That race taught me that I never wanted to run again. But one thing led to another, and I found myself running the Hartford Marathon for a second time in 2011. In that time span, I had my third baby. I was hooked on running. I ran that race 20 minutes faster than in 2008. I had been bit by the running bug. I wondered how much faster I could get. So, I kept setting goals. Fast forward two and a half years later and I have taken another 32 minutes off my marathon and running is still a huge part of my life. Running is here to stay and it’s important for me to make it a priority in my day. Moms are really good at feeling guilty about things. I am guilty of the “mom guilt”, which would dictate that I am a terrible mom if I dare spend any time or energy on anything other than my children and their activities. In reality, I am a terrible mom if I DON’T spend time on things that keep me happy. In reality, three children and a job take up a lot of time and energy. In reality, it is 100% possible to keep the kids happy, well rounded and taken care of without sacrificing or feeling guilty about taking time for the one big thing that makes ME a better me. Running helps me keep it all together. Running helps me keep that well-oiled machine of family life remain “well oiled”. For that reason, I make running a priority, but not THE priority. I get up, run and am home before the kids are rising...because I can. Not because I have to. Well, somedays, I have to. But, I do it because it’s something I love. It’s not a sacrifice if you love it. I know that balance is very important. Body, mind and spirit. “Feed” those things, keep them in check and life will balance. Running feeds those things so that I can help “feed” that balance into my family. I set running goals to get me out that door because it is not always easy. I plan to meet up with a friend to run in the early morning, that gets me out the door. Running helped me learn that I am far stronger than I think I am, physically, emotionally, mentally. We are all stronger than we think we are. If being a running mom means running the Boston Marathon, driving home that night and then getting up at 5:30 am the next morning with my 4 year old, than I will gladly embrace the challenge, and be stronger for it. Mothers are a special group of people with so much to offer one another. Give yourself the gift of running. Get out of your comfort zone, challenge yourself, run. Get to know who YOU are. You may really like who you discover. Allow it to permeate your life and see how it positively affects those around you. Set goals. Start small and see where they take you.